Finally I am getting around to posting this! My "Blogaversary", or 2nd anniversary of blog posting was back on March 15! That means I need to give something away! It's been quite a while. And, I'm going to do 2 since I'm so late and it's been so long! Leave separate comments on the two posts if you'd like to enter both! I will limit the winner to one or the other, but that way you can enter either or both! This Seed is the Best Yet set & roll of Certainly Celery Poly-Twill ribbon. 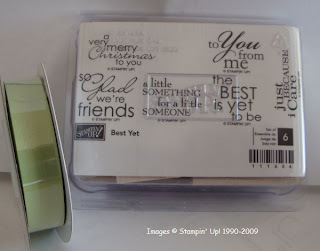 Best Yet was a Level One Hostess set from the last catalog and is Die Cut. The ribbon is from the SAB set. ETA: PLEASE leave me at least a name, preferably an email too (if you aren't a current customer) so I know who my winner is! I have several anonymous comments without a name!! I always enjoy seeing your creativeness....keep on blogging!! I haven't been to the blog in a while. I have to say those cards made with the Fifth Avenue Floral set are GORGEOUS! I may break down and get that set. I've liked everything I've seen made with it. Congrats on your blogaversary Jennifer. I always look forward to your new posts!! Happy Blogaversary to you. Thanks for sharing all the great artwork! I have enjoyed browsing your blog. I like seeing all the ideas. I will have to plagiarize since I have no creativity of my own. I am enjoying stamping. It is quite fun. Thanks, Jennifer.